Me: Dr. Langer, what should I do to be a good mentor like you? Dr. Langer: There is no equation; just follow your heart. Keeping this short yet deep advice in mind, I have kept working on my dream projects while mentoring amazing young minds at the MIT Media Lab: the UROPs. I have been so privileged to be mentored by wonderful people: Drs. Zafer Durusoy, John Rogers, Bob Langer, Wally Gilbert, Ed Boyden, Hiroshi Ishii, Tod Machover, Joi Ito and Sangeeta Bhatia are just a few to be named. In my research group at the MIT Media Lab, called Conformable Decoders, we have had much luck and joy to work with amazing UROPs since Spring 2018—only 1 year after I formed my research group and designed my very-own cleanroom, the YellowBox. The timeline of our UROP membership. I should note that my great mentor and friend, Mitch Resnick of the Media Lab, was the one who encouraged me to have UROPs in my group, even though I was not planning to accept any UROPs until we set up the group culture. In fact, our first UROP, Grace Moore from Materials Science and Engineering, was referred by Mitch. I am so glad that I took Mitch’s advice about UROPs and have those great young minds in our young-yet-ambitious research group. They certainly helped us to shape and set our group culture! Our first UROP cohort consisted of three great minds: Grace Moore from Materials Science and Engineering, Farita Tasmin from Electrical Engineering, and Henry Cheung from Electrical Engineering and Computer Science. Grace worked with our postdoc, Mohamad Tarek, on pH sensors—her results led to a scholarly publication in a peer-reviewed journal. With a very well-deserved recommendation from our group, Grace was awarded the “UROP Excellence Award in Research." 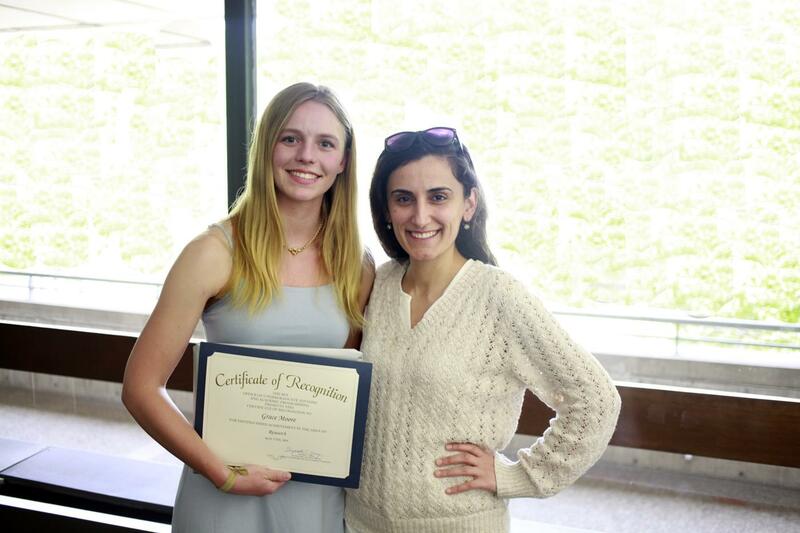 Grace Moore and I with her award certificate, “UROP Excellence Award in Research." She also became a co-author on our recent paper published in small methods. Our article, written with the help of our UROP Grace Moore, as published in small methods in September 2018. In this paper, we reported a series of essential characterization tests and parameters to objectively evaluate novel pH systems and demonstrate the pitfalls of using existing non-standardized methods from recent literature. We systematically studied (i) the inherent properties of pH sensing components, (ii) the effect of inaccurately determining the saturation values of the pH systems on response time, drift, and sensitivity, and (iii) the effect of instrumentation input resistance on the results. These are all critical issues for the advancement of pH sensing research. Nonetheless, these topics are rarely discussed or reported in the literature. This makes it challenging to objectively assess or compare various pH reports on novel pH sensing materials and configurations. 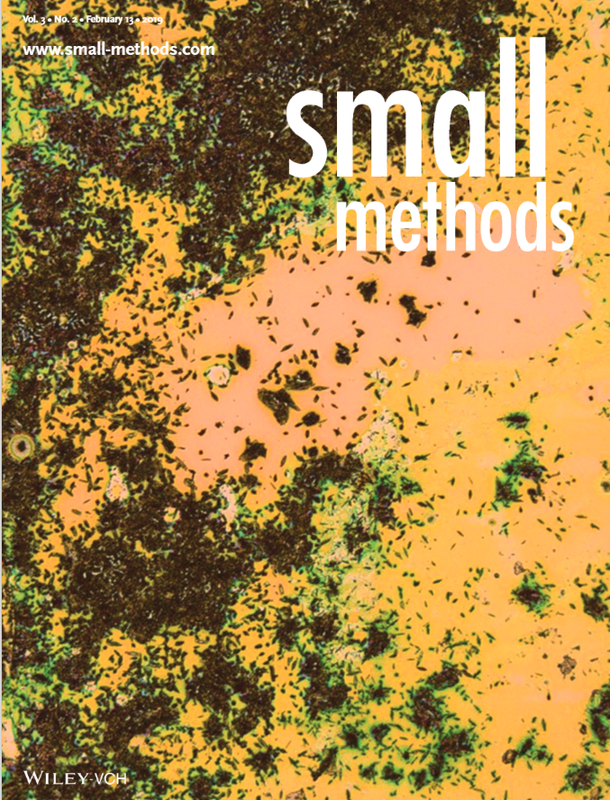 Our pH Sensor Benchmarking study was featured on the cover of small methods! Along with the MAS 808 course students, Farita contributed to the paper and became the lead author of our perspective article published in Foresight. Our perspective article, published in Foresight in October 2018. 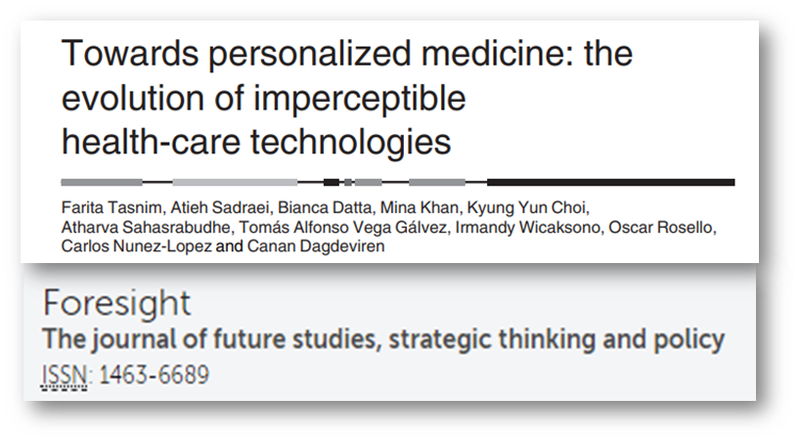 In this paper, we highlighted current attempts at mechanically adaptive devices for healthcare, and looked ahead to key aspects for the future of these conformable biomedical devices and how they will revolutionize the way healthcare is administered or obtained. We further described two major necessities for developing and commercializing mechanically adaptive devices. These devices must (i) conform to the human body, and (ii) decode its variety of patterns, i.e., seamlessly extract and interpret its biological information. Following these prerequisites, we forecasted three key aspects for the future of mechanically adaptive biomedical devices, detailing how this technology will have an impact in various sectors, namely: (1) changing the way we “do science,” (2) revolutionizing healthcare, and (3) harvesting energy for self-powered devices. We concluded this article with our perspective on the challenges of implementing this technology for practical use, including device packaging, environmental life-cycle, data privacy, industry partnership and collaboration. I was deeply honored and humbled to learn that I was awarded the 2017-2018 Outstanding UROP Faculty Mentor Award, following from a nomination by our UROP Farita. 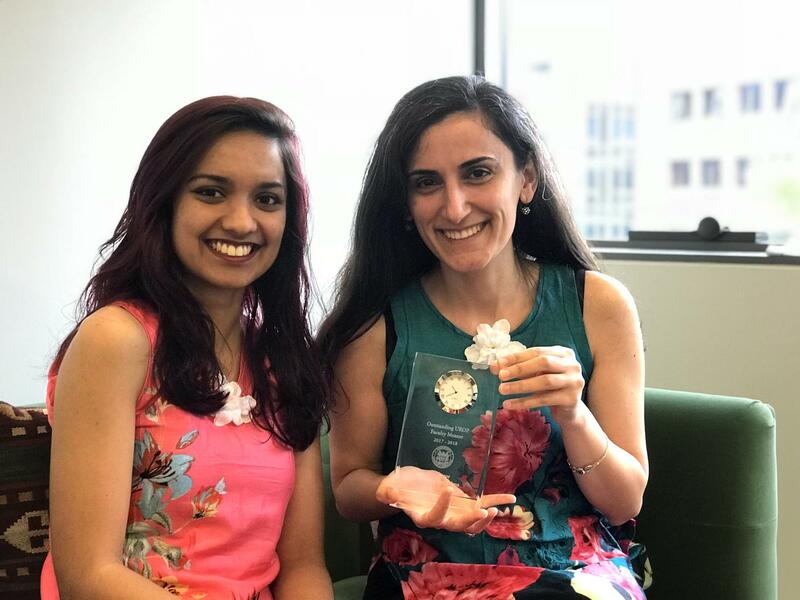 Farita Tasnim and I with the “2017-2018 Outstanding UROP Faculty Mentor Award.” We wore the beautiful dresses that Farita tailored for us! Summer 2018 was a busy but very productive season. Our UROPs—Naomi Dereje from Mechanical Engineering, Kyle Huang from Aerospace Engineering, and Athena Nguyen from Biological Engineering—worked with our postdoc, Dr. Mohamad Tarek, to compose a comprehensive review article on “Recent Progress in Electrochemical pH-Sensing Materials and Configurations for Biomedical Applications” We were invited to submit our review paper to Chemical Reviews, which has an impact factor of 52.613 (2017). All of our UROPs contributed to this review paper and became co-authors! MIT President Emerita Dr. Susan Hockfield also introduced one of her freshman advisees, Phil Murzynowski, who worked with us for a short period and became a co-author. Our invited article published in ACS Chemical Reviews in March 2019. During the summer of 2018, Farita continued her research project and worked in our cleanroom, the YellowBox. Farita Tasnim and grad student Atieh Sadraei are in the cleanroom with me. In Fall 2019, we nearly doubled the number of UROPs in our research group. Our new members were Dani Gonzalez form Electrical and Biomedical Engineering, Emmanuel Havugimana from Electrical Engineering, Rachel McIntosh from Electrical Engineering and Computer Science, Eric Pence from Electrical Engineering and Computer Science, Carson Tucker from Mechanical Engineering, Wesley Woo from Electrical Engineering and Computer Science, and of course Farita Tasmin from Electrical Engineering. In the fall, Farita was also a TA for my course Decoders 1.1: Introduction to Microfabrication (MAS 809), in which students learn cleanroom processes and fabrication techniques through lectures in class and then in the cleanroom. Students gained hands-on experience with all six components of the microfabrication techniques, including: substrate cleaning, deposition, patterning, etching, transfer printing, and testing. 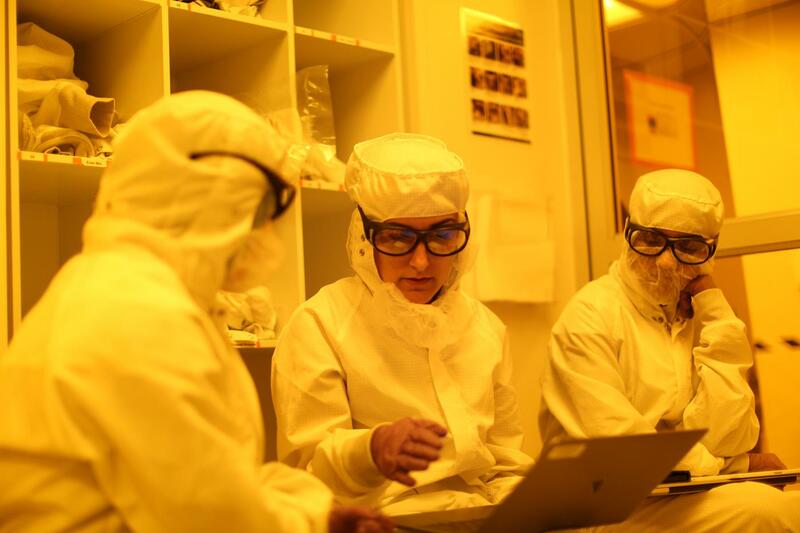 The midterm project was to create a fun, artistic video to document the microfabrication process as taught in our cleanroom, to be posted on the course website and YouTube channel. All of the UROPs who worked with us in Spring 2018, Summer 2018, and Fall 2019. Spring 2018: From left to right: Grace Moore, me, Henry Cheung, and Farita Tasmin. Summer 2018: From left to right: Naomi Dereje, Kyle Huang, me, Farita Tasnim, and Athena Nguyen. Fall 2019: From left to right: Rachel McIntosh, Dani Gonzalez, Wesley Woo, me, Carson Tucker, Farita Tasnim, and Emmanuel Havugimana. 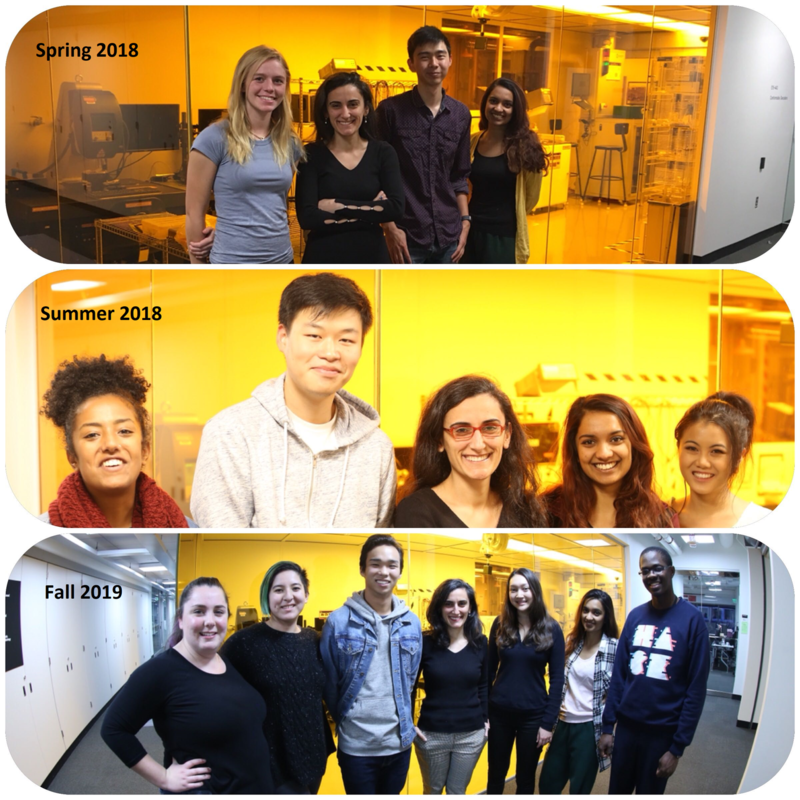 In just three semesters, we have done a lot, and I cannot wait to experience our progress in Spring 2019 and beyond—flourishing flowers, developing biomedical devices, and improving the way we understand our body and nature.